Glasgow Warriors have learned the importance of having strength in depth from Ireland's top Pro12 sides, claims captain Al Kellock. "You don't win anything with a strong 15 or 23," said the giant lock after their bonus-point win over Ulster on Saturday put them top of the table. "It has to be a squad effort and we've bought into that. "It's a lesson we've learned from the Ulsters, the Leinsters, the Munsters over the years." 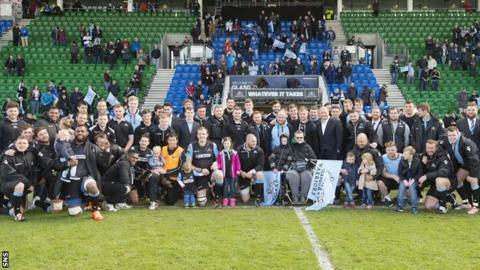 The 32-10 victory over Ulster earned Glasgow a home semi-final against the same opposition on Friday. With Warriors trailing 10-6 at Scotstoun, head coach Gregor Townsend made five changes 12 minutes into the second half to try to force a breakthrough as they sought the four tries they needed to secure a home semi-final. Three minutes later Stuart Hogg slid in Glasgow's opening try, which was followed by two from Finn Russell and the crucial fourth by Richie Vernon. Kellock, who will retire at the end of the season, told BBC Radio Scotland's Sunday Sportsound: "It's not just the 23 that played yesterday. "The conversation we had at the beginning of last week is that it is the entire squad that will determine if we win or lose at the weekend. "The quality of the training is all about the guys who aren't involved and the effort they put in throughout the week. "That is something we have been very good at and it will have to happen again this week." Kellock believes it's the squad strength that has helped the team cope with injuries to players such as Alex Dunbar and Mark Bennett. "We don't need to talk about the players that are missing because of the players that are coming in," he said. "To me, Peter Horne and Richie Vernon have been up there with the best players we've had on the park in the last couple of weeks. "Yes, we have lost a couple of great centres but the guys who have stepped up have been brilliant and that is the same in every position. "The strength we have in our squad means losing one or two players, we still have the back-up. "Look at Fraser Lyle, who got his opportunity during the Six Nations. I said at the time it was one of the best debuts I have ever seen. This is a guy who has been playing amateur rugby." Ulster will be a much-changed side for the semi-final, among them Tommy Bowe likely to be on the wing from the start, Jared Payne and Darren Cave expected to be in midfield after injury and Ruan Pienaar at half-back. Kellock, though, seemed unperturbed by Ulster's strengthening. "It is about beating the team that is put in front of us," he said. "Yesterday was about trying to get the bonus point, next Friday night will be a different game entirely. "We looked at the Ulster team expecting them to be playing most of their big names so a lot of the homework has already been done."